We’re now considered experts in the field of small lot housing. Here we will clarify some of the benefits and answer some common questions we get. What is the definition of small lot housing? Land with an average width less than 15 metres and with an area less than 450m². Affordability – You save on the size of the house and the land which means better housing affordability for the everyday Australian. Estate Lifestyle – Not only do you get a more affordable home, but you also have the security and sense of community that comes with living on an estate. Resale and Rental Value – The combination of a small lot, with a modern, clean home, often with multiple storeys and in some cases up to 4 bedrooms makes for an excellent investment property. With all these benefits, you would imagine that small lot housing would be something most builders are comfortable doing, but that’s not the case at all. In fact, even on the Sunshine Coast, where it’s taking off, we’re one of the only companies to focus on and refine the process for production. Thoughtfully designed housing matched to a range of lot sizes and household types is critical to achieving affordable and attractive housing options. Providing housing with a mix of lot sizes also results in a greater variation in dwelling prices. This enhances opportunities for affordable home ownership and rental for a range of households within a diverse community. A suite of innovative designs has been produced which challenges the traditional thinking in housing layout and build. 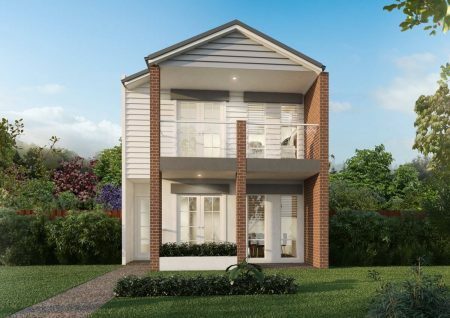 These designs deliver a diversity of layouts, offering a choice of one, two and three bedroom dwellings. Unlike traditional small housing alternatives such as units, these designs are freehold title and do not attract body corporate costs, delivering ongoing savings for the homeowner. At Thompson Sustainable Homes we’re pleased to be on the front of the wave in this design and building innovation movement. Learn more about small lots (PDF download). Here’s an artist’s impression of our Maxwell design. 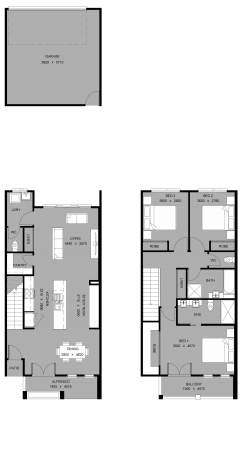 Here are the floor plans from one of our small lots housing designs. What follows are some terms that have been used to describe small lot housing. Fronting and serviced off a rear lane, a loft home provides an affordable housing option which can be delivered with freehold title. The living area is typically located above the garage and is built-to-boundary on two sides. Loft homes were developed to provide additional housing choice on Terrace and Villa lots, usually over the garage in the rear lane. The loft home is typically a one or two bedroom apartment on a community title with the parent lot. However, with coordination of the subdivision and building design, these homes can be accommodated on freehold title on lots as small as 60m2. These dwellings are often in high demand due to their relative affordability. Soho houses are designed to provide a designated work from home opportunity (home office) and are located on main street frontages. Typically, Soho houses have two street frontages and have a separate entrance for the residence. A terrace house usually addresses two streets and is rear loaded. Built-to-boundary on two sides, terrace houses provide an urban feel with low maintenance external space. Terrace lots typically range from 4 metres to 10 metres in width and are built to both boundaries. Usually car garaging for terrace lots is from a rear lane. However, some designs allow for car garaging off the street when the lot width is greater than 7.5 metres. The ability to fit up to a three bedroom home on a relatively small lot at an affordable price point makes this option attractive to the market as well. Villa lots were introduced into the Australian market in the early 1990s. Initially, minimum lot sizes were greater than 300m2, while 250m2 lots became available in the late 1990s. Today in some projects villa house designs are now available for lots from 185m2 in the area. The villa lot provides an opportunity for a detached three bedroom, single lock up garage. Usually, the house will be built-to-boundary on one side. 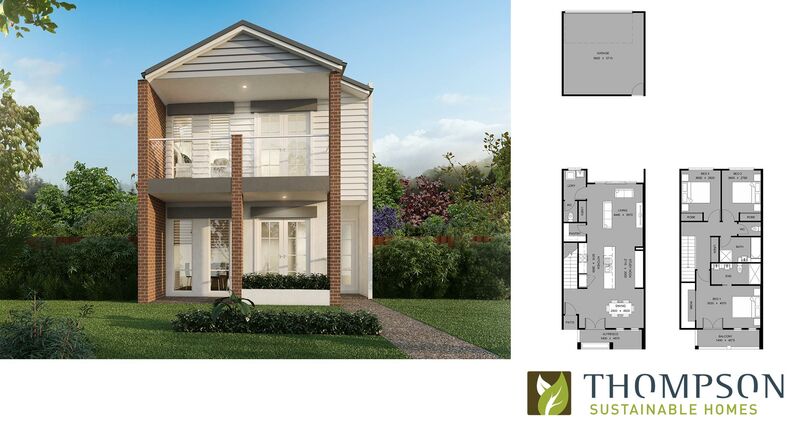 Good designs provide open plan living, a balance of indoor and outdoor living areas and architectural features to enhance this small lot home. Small lot construction is tricky but thanks to our innovative building methods and partnerships with suppliers like James Hardie, we now have it down to a fine art. You can have all the benefits of an affordable home, on a respected estate, made in compliance with regulations and safety requirements. This allows you to have access to a quality home at a price that is accessible to anyone. Want to own your own home? 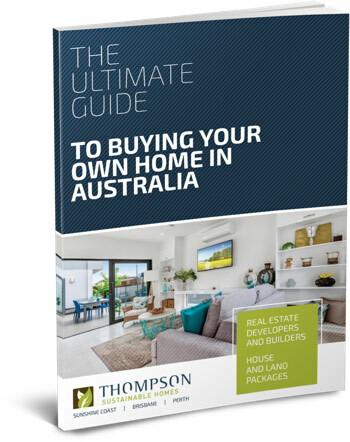 Subscribe to our newsletter and instantly download “The Ultimate Guide to Buying Your Own Home in Australia”.